The GST was formerly known as the NST (New Solar Telescope) before July 2017. BBSO has installed its 1.6 m clear aperture telescope, and first light has been attained at the Nasmyth focus. A first light image of granulation is shown in Figure 1. The new telescope offers a significant improvement in ground-based high angular resolution capabilities, and will substantially enhance our efforts to understand our dynamic star. This project is led by Phil Goode and Roy Coulter. The GST is configured as an off-axis Gregorian system consisting of a parabolic primary, prime focus field stop and heat reflector (heat-stop), elliptical secondary and diagonal flats, see Figure 2 for schematic perspectives of the telescope. An off-axis design was chosen principally because of its vastly reduced stray light, since there is no central obscuration, which reduces the telescope's MTF (Modulation Transfer Function) at high spatial frequency. The primary mirror (PM) is 1.7 m with a clear aperture of 1.6 m with a final figure residual error of 16 nm rms. The PM is made of Zerodur from Schott. The PM was figured by Steward Observatory Mirror Lab. The off-axis nature of the PM presented a number of problems in measuring the figure of the mirror. Such measurements will be essential in the precise figuring of large night-time telescopes, like GSMT. The measurements of the figure used a Computer Generated Hologram (CGH) to change the wavefront of the interferometer to match the aspheric of the PM. Although this sounds simple in principal, it requiring nearly three years of effort to make it work and be reliable. The CGH figure was tested against that from a series of pentaprism scans in which the low order residuals matched (see Mirror Lab website for details). The focal ratio of the PM is f/2.4, and the final ratio is f/50. The 120" circular opening in the field (heat) stop defines an 80''x80" maximal square field of view (FOV) of the GST. The working wavelength range will cover 0.4 to 1.7 mm in the Coudé Laboratory one floor beneath the telescope, and all wavelengths including far infrared at the Nasmyth focus on an optical bench attached to the side of the telescope structure. 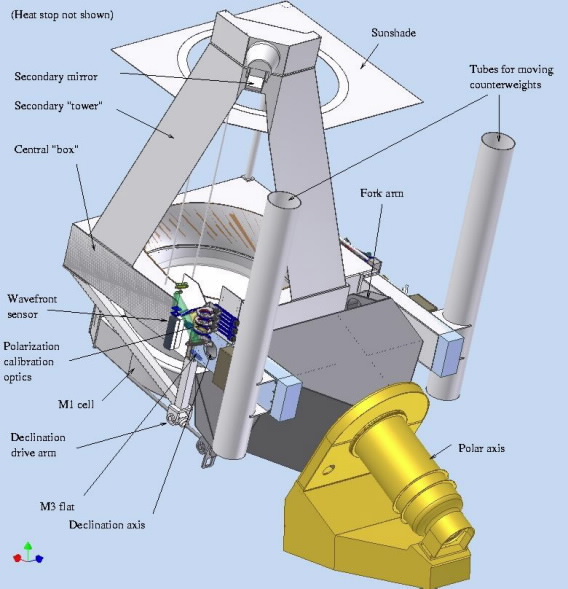 The GST is an open telescope structure with an equatorial mount. A key design issue for a large aperture, solar telescope is the thermal control system to keep the temperature of the mirrors very close to, or below that of the ambient air. The dome employs a wind-gate and exhaust system to control the airflow from the wind, which helps to maintain the same temperature inside and outside the dome, and clear concentrations of heat in and around the optical paths. In addition, we have implemented a closed cycle, chilled air system as part of the OSS (Optical Support Structure) to limit so-called "mirror seeing" by sweeping away turbulent cells and directly cooling the PM. After each day of observations, the PM will be cooled overnight to ensure that it is somewhat cooler than ambient in the morning. The OSS and active support mirror cell were built and tested by DFM Engineering in Longmont, CO. The PM is supported by 36 actuators that can bend out low-order aberrations, such as those due to gravity and/or thermal effects. The OSS was installed and tested in BBSO in during the Fall of 2008. Alignment and first light observations followed and are on-going. Figure 2. (left) A detailed drawing of the GST. Left: the east side of the telescope, showing the Nasmyth focus bench. The declination drive arm is also seen. Right: the west side, showing the optical path near the M3 mirror and the location of the polarization calibration optics. The new, larger dome, required to house the GST, is fully operational, and all construction under the dome (such as the extension of the support pier) was completed early in 2008. The elliptical secondary mirror (SM) is finished and silvered, and has been tested by both SORL (Space Optics Research, which figured the SM) and Steward Observatory Mirror Lab. Steward figured the PM. The PM is active with its 36 actuators, and its shape will be controlled by a wavefront sensing system (see http://www.wavefrontsciences.com), which resides immediately before M3. The latest version of the BBSO telescope headquarters control system software has been written in BBSO and is being modified as observations proceed. While this software is not essential for early observations, it will make them somewhat less cumbersome. The GST requires adaptive optics (AO) for diffraction limited imaging. We have successfully operated our AO system on BBSO's old 0.6 m telescope, which was donated to the Los Angeles Amateur Astronomy Society. The AO system is characterized by a 97 element deformable mirror and Shack-Hartmann wavefront sensor, which samples the telescope entrance aperture with 76 lenslet elements. Hence, its name "AO-76". The set-up has undergone laboratory experiments in Big Bear, so that it will be ready when GST light is fed to the Coude Lab in the Summer of 2009. This design is simpler and more robust than that used on the old 0.6 m telescope. The design problems for the AO-76 on the GST were simpler than those for AO-76 on the old 0.6 m telescope because AO-76 was a difficult retrofit to a telescope that was never meant for AO. However, our experience with AO-76 on the old telescope will make the implementation of the AO-76 for the GST relatively straightforward. Only the feed optics and the reconstruction matrix for inverting the wavefront sensor output need to be changed. AO-76 on the GST will be very nearly achromatic, unlike AO-76 on the old telescope. Still, AO-76 will provide diffraction limited images in the near IR (NIR). Thus, we are developing, in collaboration with NSO, an AO system based on a commercially available, 349 actuator DM (AO-308), which based on our error budget analysis, we realistically expect to achieve a Strehl ratio of 0.3 (the minimum required Strehl for diffraction limited imaging) in the detector plane in the visible for median BBSO seeing conditions. The high order AO system is further motivated because polarimetric observations with a low Strehl ratio range from difficult to impossible to interpret. The problem here is that the requisite opposite polarity measurements are often closely (tenths of arcsecs) spaced together. This is why we will initially concentrate on the NIR. The Strehl ratio, generally used to quantify the performance of an AO system, is the ratio of the maximum intensity in the AO corrected image in the detector plane to that from a theoretical, perfect imaging system operating at the diffraction limit. Figuring of primary mirror (PM) to 16nm r.m.s. Secondary figured to 20nm accuracy and has protected silver coating. Telescope optics (PM,SM) made of Zerodur. 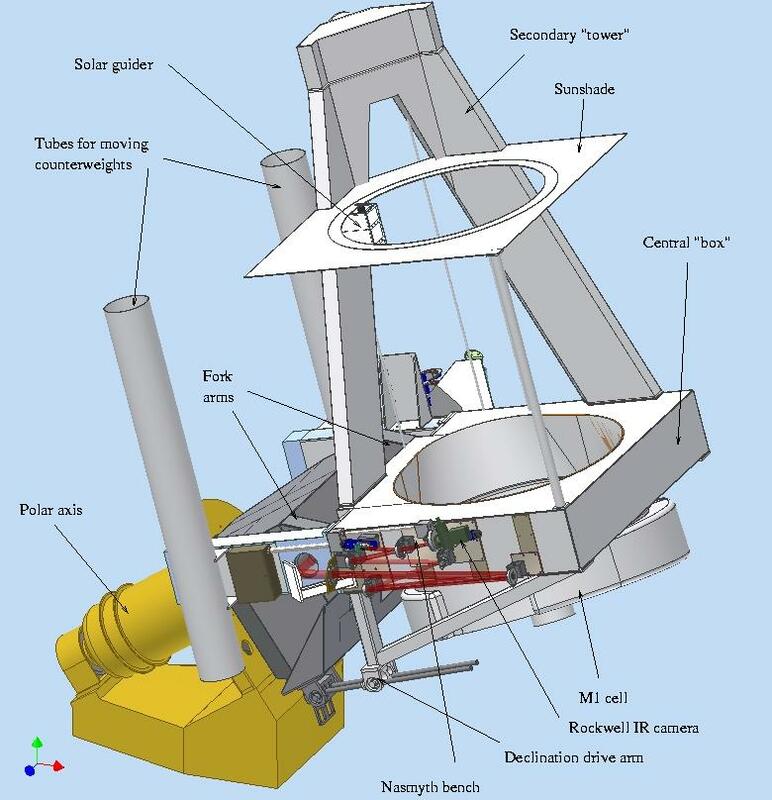 BBSO NST: Why a New Telescope? © BBSO/NJIT - Last modified: July 27, 2017.